The TT RS is the "Rodney Dangerfield" of sports cars. It doesn't get the respect it deserves and often gets overlooked in any discussion of sports cars or future classics. And that is a shame because I'd argue the TT RS is the gold standard for a fun, practical sports cars. Before you try to have me committed for heresy, read on and hear me out. You might find yourself in agreement or at the very least, looking to find a TT RS to test drive. Styling is in the eye of the beholder. The RS certainly looks more aggressive than the standard TT and I think it definitely looks better in some colors (white, dark grey or red). There have been a number of pleasant surprises with this car, but one I never expected is how much presence the car has. The car gets noticed far more often than I would have thought. The interior is dark, mostly black on black, and the controls are basic. The controls themselves as well as the knobs feel a little cheap for a $60,000 car. Audi did not spend any of the TT RS' pricetag on the interior. 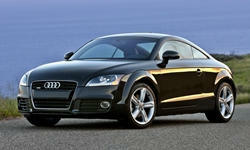 The head unit was last generation Audi when the TT was new. The best part of the head unit is that it is a standard double DIN size and easily replaced. Audi did spend your money on the pwertrain and this car is fast. In stock form, this 3300 lb car has 343 lb/ft of torque and 360 hp. A simple SW upgrade of around $1,000, both of those numbers rise to the 400 lb/ft/hp range with virtually no hint of turbo lag. We are talking fast as in 0-60 times around 4 seconds flat. Fuel economy is not that great around town, but respectible on the highway (around 30 mpg). But you don't get a car like this for its fuel economy. The car handles very well. It is a FWD biased car with power going to the rear wheels as needed. As such, it does not feel like a RWD car and the tail is not prone to whip out like its RWD compatriots. But here is the dirty secret no one talks about, the power and handling of modern true sports cars pretty much uniformly exceed what can be done with any degree of responsibility on public roads and the TT RS is certainly no exception to this rule. Braking, as should be expected, is outstanding. Brakes designed to handle the rigors of the track tend to do very well on the road. The ride is surprsingly good for a sports car and the TT RS actually feels more like a GT on the road. My wife says it rides better than my Mazda6 did and I agree. The TT RS is a great road trip car. As for noise, the car is noisy enough to let you know you didn't buy a Camcord, but not obnoxiously loud. If you want a quiet car, look elsewhere. Front seats are reasonably well cushioned and supportive. The driving position is good and visibility is surprisingly good in all directions. Probably due to how low and small the car is, iti is very hard for another car to hide in your blind spots. Biggest problem is pulling too close to a stoplight as the sloping roof can obscure the light. Interior storage is good, especially by sports car standards. The rear seat is a joke. Unless you have something you don't want rolling around in back, the back seats are best left down. Cargo capacity with the rear seats down is OUTSTANDING. You will rarely have to leave this car home to carry something. I can fit my 100 lb dog in the car for short trips, its that big. Controls and instruments are basic but adequate. This is not the car if you need all the bells and whistles. Audio was last gen when the car first came out and the nav cannot compare to what you can get on your phone. Materials/workmanship are generally good. Reliability has been excellent so far and maintenance costs have been reasonable. Depreciation should be below average for the car as only 1200 cars were imported over the two years the car was available. The TT RS is a fun sports car that is very practical for its class and particularly given its size. If you have these values, it is hard to find an alternative. Porsches? Turbo charging may give the Cayman/911 the low-end torque so valuable in daily driving on the road, and then again it may not. And the 911, which is the only one with any room inside, would be far more expensive. The Vette is the sports car bargain in the US, but is much larger and offers much less room than the TT. The best comparison is probably the BMW M2. Pricing is similar, power/torque are similar and between the back seat and trunk, the cargo space of the M2 is similar to the TT RS.